Whenever I see a cluttered mess, I see lost money. Think about what a cluttered shelf or a closet or a drawer really contains. It holds items that you don’t really have an appropriate storage place for. It usually contains at least some items that have been forgotten by the person using the cluttered space, as well as many more that the person thinks are somwhere in the clutter but unsure as to the exact location of. It’s often full of items that have only been used once or twice – or, sometimes, not used at all. Many of the items in the cluttered space are “someday” items, meaning that you think you might use them some day or use them on an extremely irregular basis. 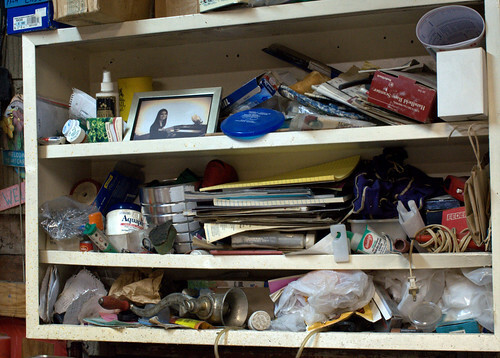 Clutter is a sign that you have too much stuff. You have items you rarely (or never) use. You have items that you don’t have an appropriate place for. You have items you aren’t properly caring for. Wherever you find clutter, you find a place where financial improvement can happen. First of all, clean out that cluttered area. Take every item out of the cluttered spot and evaluate those items one at a time. The evaluation is key. You should ask yourself whether or not you’re really going to use this item in any significant way in the future. Honesty is incredibly valuable here. You should also consider whether or not someone else might have a much better use for this item. If you come to the conclusion that you should no longer own the item, move it out. Selling the item is certainly one option, but giving it to a friend or someone else who might use it is another worthwhile option. If you decide that you should keep the item, figure out a real spot for storing the item when you’re not using it so that it can easily be found and retrieved. In either case, clearing out the clutter should result in a reduction in the amount of stuff you have, with only items you don’t use going out the door, and an increase in the resources you have, as you’re changing items you don’t use into cash or tax deductions or stronger relationships. It will also save you time in the future, as it will be easier to find the items you have. Over the next week or two, we’ll look at specific tactics for handing particular types of clutter and how to revamp it to save time and money.